Note about the brass spoon! Julia Lemke has got to be one of (many) my most talented friends. She's a local Bay Area ceramicist, jeweler, designer, and the brilliance behind Totem. Totem also has spoons in a variety of sizes, the one above is perfect for serving nuts, olives, and . . . granola. Check out her work and find it throughout the bay area at local shops. 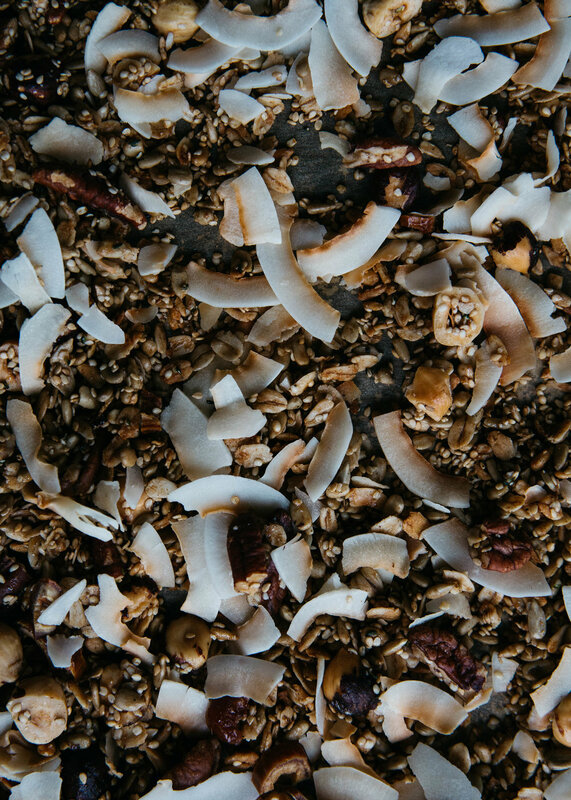 Speaking of granola... Who doesn't love the crunchy sweet texture that granola has to offer? It's great on it's own as a travel snack or accompanied by yogurt or your favorite dairy free milk. And, although there are some really delicious (and gf friendly) granolas out there (hey, nana joe's! ), I find that many of them have processed sugars or other ingredients that I like to avoid. Not only that! Nuts and seeds are a phenomenal way to get protein, fiber, and vital minerals like magnesium, calcium, and vitamin B6. Vitamin B6 is a key co-enzyme for metabolizing carbs, helps to calm and support a healthy nervous system, and supports adrenal function (view more here). This recipe calls for a few of my favorite ingredients like dates, coconut, and hazelnuts, but - it's totally adaptable to what's in your cabinet as you can use any combination of nuts and seeds! The recipe calls for 3 cups total of nuts and seeds - so walnuts, cashews, pumpkin, flax, chia seeds would all be great substitutes for any of the ones listed below. If you don't have enough nuts/seeds, then increase the oats. And, lastly, this version of granola is warm! so it's perfect for a chilly day. You could even add in some more warming spices like turmeric, nutmeg, and/or clove! It's best to store your nuts and seeds in the refrigerator or freezer because they have a high fat content and go rancid quickly. This is because unsaturated oils oxidize quickly when exposed to air, heat, and light. When I buy from the bulk section, I always make sure to taste a nut/seed before filling my bag. And in general buy my nuts and seeds from stores I know have a high turn over (meaning the nuts/seeds haven't been sitting there for months). 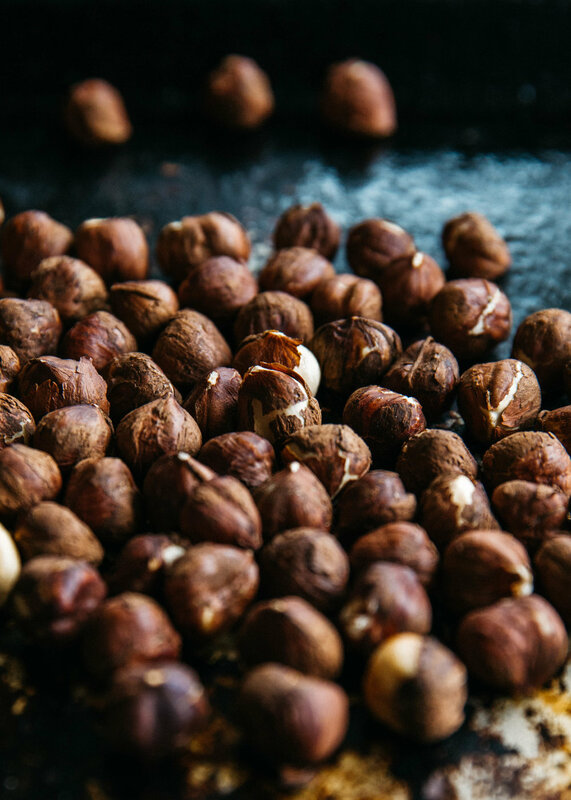 These hazelnuts have been toasted and are ready to be vigorously rubbed in a dish towel! To Toast the Hazelnuts: Lay the hazelnuts in a single layer on a baking sheet and bake for 15-20 minutes. Check after 10 minutes and give the baking sheet a good shake to toss the nuts. The hazelnuts are ready when you see the skin start to split and the flesh is turning golden. Don't over toast as you'll be baking them again. To remove the skins, wrap the hazelnuts in a dish towel and rub vigorously. The skins might not entirely rub off and that's ok. Next, roughly chop them and pour them into a large mixing bowl. Once the hazelnuts are done, turn the oven up to 300 F and line two (2) rimmed baking sheets with parchment. In the large mixing bowl add the oats, the nuts and seeds, cinnamon, and sea salt. Pour in the melted coconut oil mixture and stir until well combined. Spread the mixture on one of the baking sheets into an even layer. Press firmly down on the granola (helps create clusters). Bake on the center rack for 25-35 minutes, or until the granola is lightly golden in color. If you're not sure, you can take out a spoonful, let cool for a minute and taste. In the last 10 minutes, mix the coconut flakes in the same large bowl with the chopped dates. Mix in the reserved 2 tbsp of the coconut oil liquid. Spread it on the second baking sheet and bake for 5-10 minutes until the coconut flakes are turning golden, but not completely brown. Remove the two baking sheets and let them cool without stirring. Once cool, mix the two together. Store in an airtight container at room temperature for up to two weeks. Heat milk in a covered sauce pan with the cardamom over medium-low heat. The milk is done when it's hot and the cardamom has infused its flavors, about 5-10 minutes. When done, pour the milk through a fine mesh strainer (straight into your bowls or a cream vessel. Get yourself a bowl! Add in a 1/2 cup of the granola with 1 cup of the warm milk and enjoy!